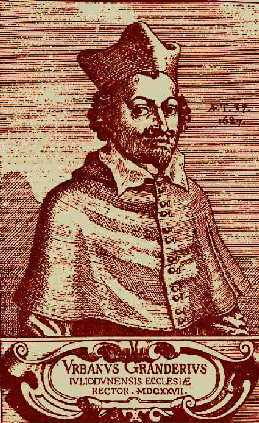 On August 18, 1634, Urbain Grandier, a parish priest from St.-Pierre-du-Marché of Loudun, France, was executed for the crime of sorcery, when all he was really guilty of was ignoring that pesky vow of celibacy (like most clerics before him, including Pope Alexander VI who had seven known children) and provoking the anger of the chief minister of France, Cardinal Richelieu. Father Grandier began setting himself up for trouble in 1618 when he penned a scathing opinion piece about Cardinal Richelieu. There wasn’t much Richelieu could do to retaliate at the time, but that would change by the 1630s when he would become one of the most powerful men in the country. It was easy for Richelieu to enlist the help of the Ursuline nuns in bringing down Grandier, not only due to his exalted position as Cardinal, but because the Mother Superior, Sister Jeanne of the Angels, had her own score to settle with the priest. Grandier had refused to become the spiritual director of the convent, which really miffed Mother Superior, who purportedly had a thing for the womanizing priest and wanted to get in on that action. So when Cardinal Richelieu suggested that maybe Grandier had given the good Sisters a case of the devils, the nuns all of a sudden found themselves having hysterical convulsions and uncontrollable fits. Funny how that happens. The nuns struck their chests and backs with their heads, as if they had their necks broken, and with inconceivable rapidity; they twisted their arms at the joints of the shoulder, the elbow, or the wrist, two or three times around. Lying on their stomachs, they joined the palms of their hands to the soles of their feet; their faces became so frightful one could not bear to look at them; their eyes remained open without winking… They uttered cries so horrible and so loud that nothing like it was ever heard before. They made use of expressions so indecent as to shame the most debauched of men, while their acts, both in exposing themselves and inviting lewd behavior from those present would have astonished the inmates of the lowest brothels in the country. A little artistic license perhaps? We, the influential Lucifer, the young Satan, Beelzebub, Leviathan, Elimi, and Astaroth, together with others, have today accepted the covenant pact of Urbain Grandier, who is ours. And him do we promise the love of women, the flower of virgins, the respect of monarchs, honors, lusts and powers. He will go whoring three days long; the carousal will be dear to him. He offers us once in the year a seal of blood, under the feet he will trample the holy things of the church and he will ask us many questions; with this pact he will live twenty years happy on the earth of men, and will later join us to sin against God. Bound in hell, in the council of demons. By this juncture, some of the nuns who got Grandier into this mess and wanted to recant were not allowed to do so because they must themselves still be under the influence of Satan to even consider such a thing! He was then dragged to the stake to be burned alive. He was not granted the mercy of being strangled first as most victims of this particularly nasty method of execution were. He died without confessing or implicating anyone else, much to the annoyance of Cardinal Richelieu. Farcical trials and executions like Urbain Grandier’s for witchcraft were repeated many times over both in Europe and the New World, before and after his suffering. For hundreds of years, the accusation of witchcraft could cause one to lose their property, reputation and very life if you got on the wrong person’s bad side. Even those statements (in the present essay) that may be factual are of no valid, helpful use to mankind in the 21st Century. This is one of the most horrendous pieces of anti-religious (and specifically anti-Catholic) garbage that I have ever seen in my life. You people (especially the author and the owners of the site) ought to be ashamed of yourselves. God will not be mocked, and you will not go unpunished for this after you die, if you fail to repent and try to make amends. The author of this slime, having failed to perform the necessary research, does not even know that Fr. Grandier (like the majority of priests) did not take “vows” (because they were/are diocesan/secular priests, not members of vow-taking religious orders/congregations). Worse yet, the author has the gall unjustly to smear more than half of the millions of “clerics” who served mankind for 1,600 years before Fr. Grandier. “[M]ost clerics before him” failed to remain celibate, she claimed. She has NO IDEA WHATSOEVER — except in her (for some reason, hate-filled) imagination — how many “clerics” failed to keep their promise to be celibate after ordination. She probably also has no idea that countless thousands of Eastern Catholic and Eastern Orthodox priests (mainly those serving in Asia and Eastern Europe) have always been permitted to get married before being ordained.